MRG especially applauds the inclusion of Goal 10, which aims to ‘Reduce inequality within and among countries,’ and references in the SDGs to indigenous peoples, pastoralists, fishers and other marginalised groups. The focus on non-discrimination is also very welcome, as is the commitment to disaggregating data. But the international rights organisation is dismayed by the lack of specific mention of ethnic, linguistic and religious minorities, despite repeated efforts for their inclusion. As a recent MRG briefing argues, ensuring greater equality for minorities and indigenous peoples benefits not only these communities, but also helps countries achieve more sustainable development for their whole populations. ‘For excluded groups, the barriers to participation and access to services extend way beyond resource limitations or weak governments. Inequalities in health, education, livelihoods and other areas are interconnected, so governments need to address disparities across all sectors of development,’ says Soderbergh. For instance, the teacher/pupil ratio at pre-primary level for Turkana in Kenya is 1:104, compared with the national average of 1:28. Only 38 per cent of Dalit women in India have access to adequate sanitation and water, compared to an estimated 60 per cent of non-Dalit women. The private sector is repeatedly mentioned in the Goals as a crucial partner in sustainable development, but there is no acknowledgement of the possibility of its negative impact, especially on minorities and indigenous peoples. ‘The SDGs need to be read alongside the Addis Ababa Action Agenda, which MRG feels is far too weak with regard to business and human rights, and contains scant recognition for the need for meaningful private sector accountability,’ adds Soderbergh. More than 150 world leaders will attend the UN Sustainable Development Summit from 25-27 September at UN headquarters in New York to formally adopt the 2030 Agenda for Sustainable Development. 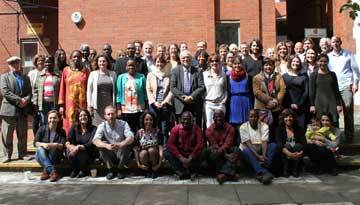 MRG, along with many others, has been involved in shaping the upcoming 15-year global development plan. 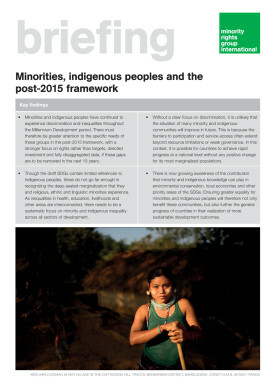 Download MRG’s most recent report on the Sustainable Development Goals and read about our work over the last decade on minorities, indigenous peoples and development. MRG works to ensure that development reaches the most marginalised communities. This is informed by our work with minority and indigenous groups in over 60 countries.